The Rimé movement is a Buddhist school of thought founded in Eastern Tibet during the late 19th century largely by Jamyang Khyentse Wangpo and Jamgon Kongtrul Lodro Thaye, the latter of whom is often respected as the founder proper. It seeks to unify the various traditions and their philosophies into one coherent school of thought, and is responsible for a large number of scriptural compilations. The school’s name is derived from two Tibetan words: Ris (sectarianism) and Med (refutation), which combined expresses the idea of unification, as opposed to sectarianism. The Rimé movement therefore is often mistaken as trying to unite the various sects through their similarities, which was not the case. Rather, Rimé was designed to recognise the differences between traditions and appreciate them, while also establishing a dialogue which would create common ground. It is considered important that variety be preserved, and therefore Rimé teachers are generally quite careful to emphasise differences in thought, giving students many options as to how to proceed in their spiritual training. Students who associate with Rimé do not leave their old traditions, but rather continue practising as their regular tradition would ascribe. Two of the founding voices of Rimé were Jamyang Khyentse Wangpo and Jamgon Kongtrul Lodro Thaye, both from different schools. Thaye was from the Nyingma and Kagyu traditions, while Wangpo had been raised within the Sakya order. At the time, Tibetan schools of thought had become very isolated, and both Wangpo and Thaye were instrumental in reinitiating dialogue between the sects. 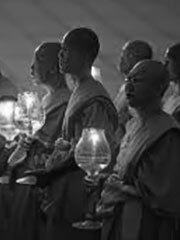 Rimé was, to some extent, the re-establishment of a fading rule in Tibetan Buddhism: That to ignorantly criticise other traditions was wrong, and that misunderstandings due to ignorance had to be immediately alleviated. Rimé is not a spiritual lineage, but rather a philosophical movement which seeks to establish, preserve, and cultivate dialogue between varying traditions, appreciating their differences and emphasising the need for variety. It was initially created to counteract the growing suspicion and tension building between the different traditions, which at the time had, in many places, gone so far as to forbid studying one another’s scriptures. Rimé became thereafter an integral part of the Tibetan tradition, and continues to be an important school of philosophy in Tibetan Buddhism. Jamyang Khyentse Chökyi Lodrö, Khunu Lama Tenzin Gyatso and Dilgo Khyentse Rinpoche are recent Rimé masters, known for their public influence and as being advisors to the 14th Dalai Lama. Other modern adherents include the late 16th Karmapa and Dudjom Rinpoche, both of whom gave extensive teachings from the works of Jamgon Kongtrul Lodro, as well as Akong Rinpoche who, with the late Chogyam Trungpa helped establish Tibetan Buddhism in Britain. The lineage of the late Nyoshul Khenpo Rinpoche, also a venerable master of the rimé tradition, is represented today in the teachings of Lama Surya Das.